Not to be confused with King Bomb. 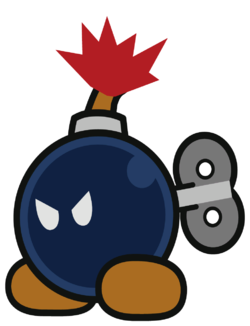 Giant Bob-ombs are a larger variation of Bob-ombs with a wider range of explosion. In Super Mario Strikers and Mario Strikers Charged, the Giant Bob-omb appears as an item. It is similar to the Bob-omb items, but instead of several Bob-ombs falling in a row, the Giant Bob-omb falls on one spot and explodes, hitting anyone nearby. However, it affects the user's teammates as well, so the item should be used with caution. Wario may also use this in one of his disappointment scenes in Mario Strikers Charged, in which he pulls out a Giant Bob-omb, which explodes on him. Giant Bob-ombs also appear in Mario Sports Mix in the dodgeball game called Bob-omb Dodge, and are more dangerous than ordinary Bob-ombs. They have a wider blast range than the normal Bob-omb in this game, and cause twenty-five points of damage to the players. Giant Bob-ombs also appear in Mario & Luigi: Dream Team and Mario & Luigi: Paper Jam as minor obstacles. In the first game, the Elite Trio has an attack featuring a Giant Bob-omb. In Super Mario Maker and Super Mario Maker for Nintendo 3DS, the player can make a Bob-omb bigger with a Super Mushroom. Aside from size, there is no difference between big and regular Bob-ombs. In Paper Mario: Color Splash, they act as explosive material to destroy the black paint mixing room of Black Bowser's Castle. In Mario Tennis Aces, a large Bob-omb is used by the black Shy Guy boss in the final stage of Shy Guy Train Tussle. When its health is fully depleted, it will throw a single large Bob-omb at the players. The Bob-omb must be knocked back and forth between each player and the Shy Guy until it explodes on the the enemy and defeats it.